Congested peak-hour streets are dangerous places to ride bicycles in Sydney. Even after the cycleway’s removal, College Street remains one of the busiest cycling routes into the CBD. More than 2,000 bike riders are still using College Street each weekday morning. College Street is a key access point for Eastern Suburbs riders and is currently a mess of merging traffic conditions, frustrating all road users. Current conditions place bike riders in the direct path of drivers, endangering their lives and forcing them to take risks in order to negotiate the speeding traffic. City of Sydney data from the original College Street Cycleway shows that a bike rider was involved in a crash once every 258 days. Since its removal, a bike rider is now involved in a crash once every 92 days. Super Tuesday Bike Counts also show a sharp decline in bike rider numbers after the lane’s removal in September 2015. Protested by Bicycle Network, the removal of the College Street cycleway is the first and only time a state government has ever built and then dismantled a separated bicycle lane in Australia. Now’s the time to bring it back. Reconstruct the separated and connected College Street cycleway. Re-build the ramp and slip-lane that was on the corner of Park Street and College street to ensure bikes can easily avoid the intersection. With the anti-bike ghosts of previous governments gone, people who ride bikes in Sydney are optimistic. We want the current government to understand the importance of this piece of infrastructure. If NSW doesn’t fully embrace bike riding as a primary mode of transportation, it will be doomed as a place that people are willing to happily live, work and play. Collective action makes a difference. Join the campaign – together we can bring back the College Street cycleway. Help send our decision makers a strong message about College Street. 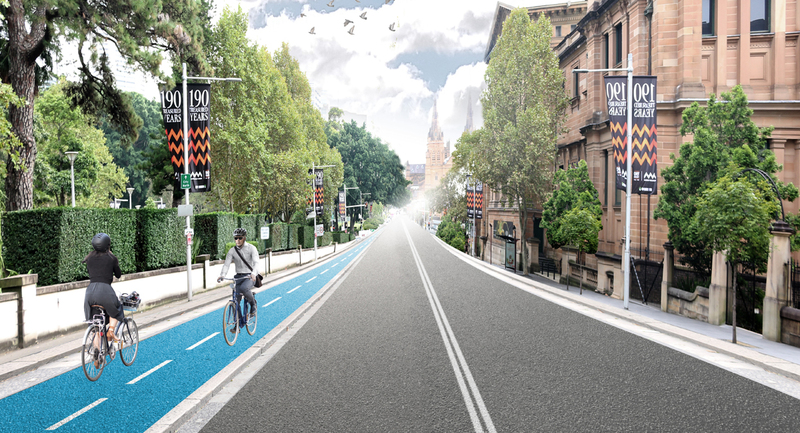 Join us and together we can bring back Sydney’s College Street cycleway. Share the petition, the campaign or your wish for urgent action on College Street.